쌍계사는 통일신라 성덕왕 21년(722) 대비화상과 삼법화상이 세워 옥천사라 불렀다고 하며 정강왕(재위 886∼887)이 두 개의 계곡이 만나는 절 주변의 지형을 보고 쌍계사로 고쳤다고 한다. 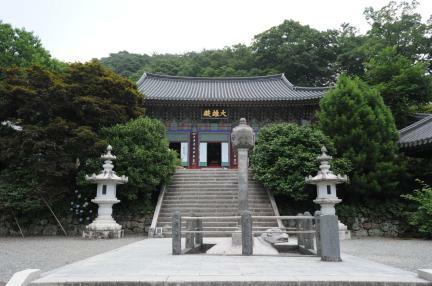 임진왜란 때 절이 불에 탔던 것을 벽암대사가 인조 10년(1632) 다시 고쳐 세워 오늘에 이르고 있다. 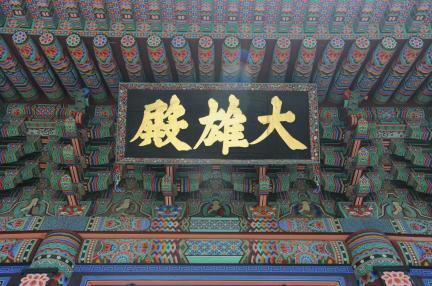 절의 중심 법당으로 석가모니 불상을 모신 대웅전은 이 때에 다시 지은 건물로 짐작한다. 규모는 앞면 5칸·옆면 3칸이고 지붕은 옆면에서 볼 때 여덟 팔(八)자 모양을 한 팔작지붕이다. 지붕 처마를 받치기 위해 장식하여 짜은 구조가 기둥 위뿐만 아니라 기둥 사이에도 있다. 이를 다포 양식이라 하는데 밖으로 뻗쳐 나온 재료들의 형태가 비교적 우아한 곡선과 오래된 양식을 보이고 있다. 가운데 3칸에는 4짝의 여닫이문과 기둥 사이에 공포를 2개씩 놓고 있으며, 양쪽 끝 칸은 2짝씩 문을 달아 공포를 1개씩 놓았다. 건물 천장은 우물 정(井)자 모양으로 천장 안쪽을 가린 우물천장으로 꾸몄고 불단 위로 지붕 모형의 닫집을 화려하게 만들어 놓았다. 전체적으로 기둥이 높아 건물의 규모가 크게 느껴지는데 조선시대 불교 목조 건축의 형태를 잘 보존하고 있어 중요한 연구 자료가 되고 있다. 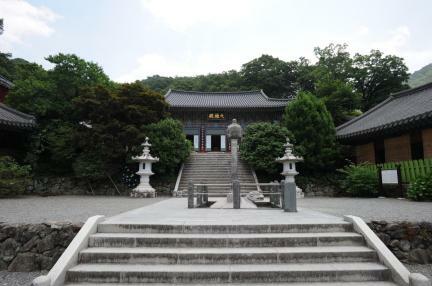 The Daeungjeon, the main hall of Ssanggyesa Temple* where the Buddha statue is enshrined, is believed to have been rebuilt at the time of the temple’s reconstruction in 1632. It is composed of five kan (a unit of measurement referring to the distance between two columns) at the front and three kan at the sides. 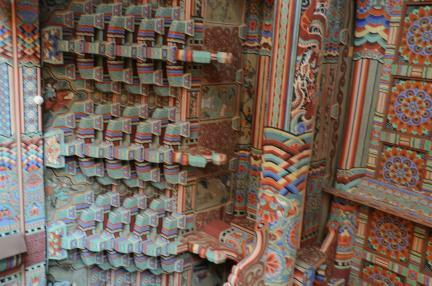 The hall has a half-hipped roof which resembles the shape of the Chinese character 八 (pal, meaning ‘eight’). 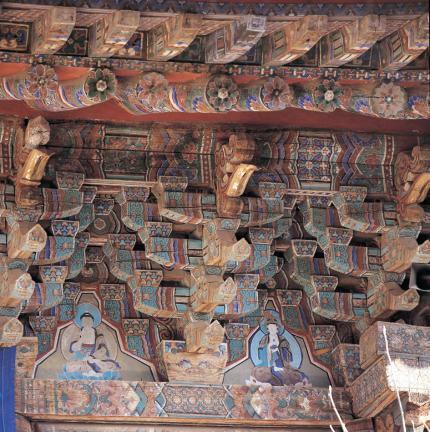 The eaves of the roof are supported by a bracket system consisting of brackets with decorations, placed both on and between the pillars. This building style is known as the profuse bracket system with its bracket materials stretched to the outside showing elegant curves and a traditional style. 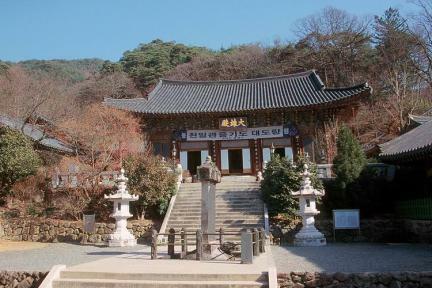 Two pairs of sliding doors are installed in the three kan in the center of the hall and two brackets are placed between pillars, while a pair of doors is installed in the other two kan of both ends and one bracket, between pillars. 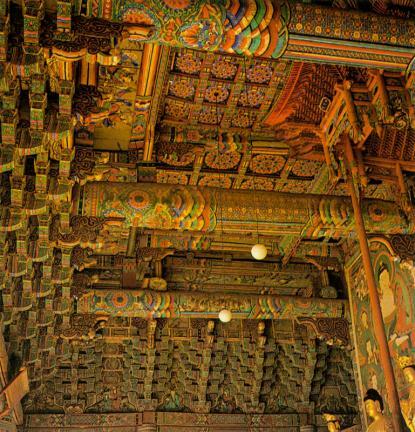 The ceiling is decorated with patterns of the Chinese character 井 (jeong, meaning ‘a well’) which serves to conceal the inside of the ceiling. 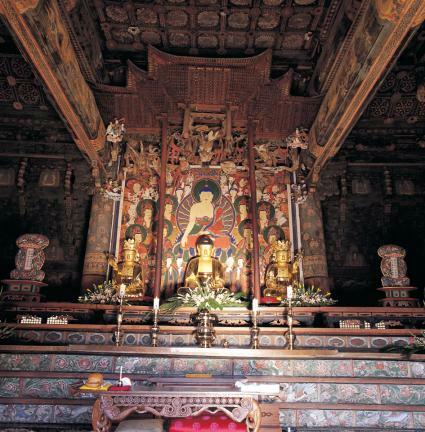 A roof-shaped canopy enshrining the Buddha statue is installed above the altar. 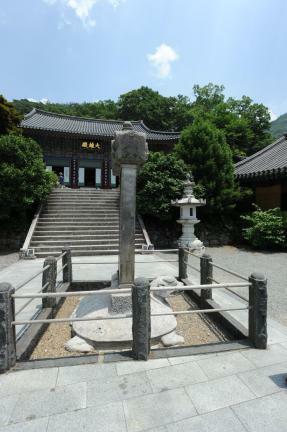 With its high pillars, the hall appears huge. 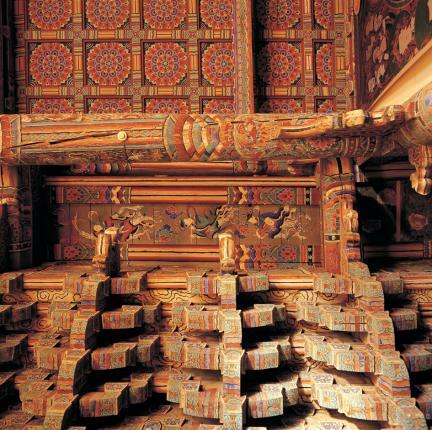 It is regarded as an important cultural asset and as a source for research as it retains the shape and style of the wooden Buddhist architecture of the Joseon Dynasty. 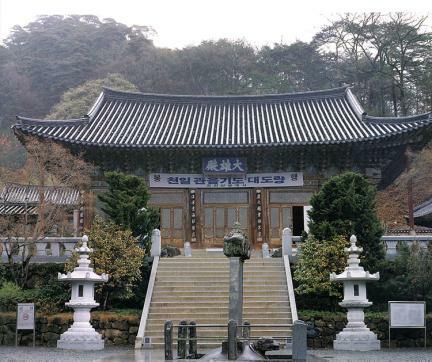 *Ssanggyesa Temple was originally called Okcheonsa Temple when it was built by two Buddhist monks, Daebihwasang and Sambeophwasang, in 722, the 21st year of the reign of King Seongdeok of the Unified Silla Dynasty. 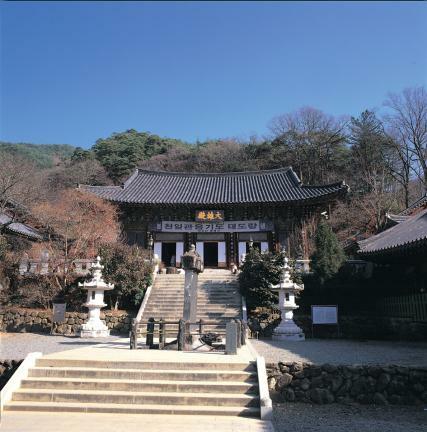 The name Ssanggyesa (‘two valleys’) originates from the geographical features around the temple, which was built at the meeting of two valleys. 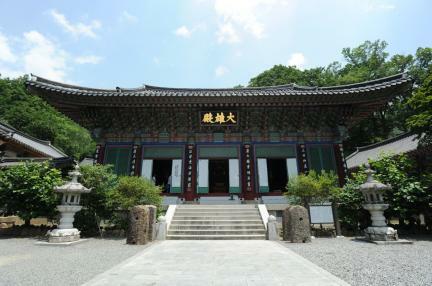 The temple was burnt down during the Japanese invasion of Korea in 1592 and was rebuilt by a Great Buddhist priest, Byeogamdaesa, in 1632, the 10th year of the reign of King Injo of the Joseon Dynasty.